Sacred Valley, Peru - February 4, 2015 - Blog from Ollantaytambo, Peru | South America!! This is an astoundingly beautiful place! Much of God's world is but this place is full of color, mountains, valleys and history. To me it is the highlight of our trip so far. Imagine walking around towns with stone streets and town buildings originally built in the 1500's Some have foundations and walls, however, built maybe 500 years earlier by the Incas. As you recall from history lessons, the Incas where highly intelligent people whose primary occupation was agriculture. They created ways to irrigate their farms and to terrace mountains to prevent erosion and landslides but also to expand farming space. They grew many varieties of beans; they raised crops of colorful corn and potatoes of many sizes and colors. They grew wheat and quinoa. They, like the Egyptians, learned to perform brain surgery, and like the Egyptians, Aztecs and Mayans, they mummified their dead. The Incas also were great architects and built structures that withstood earthquakes and channeled water from the mountains underground to the cities and villages. In the mountainsides, they built stone fortresses, grain stores and the all-important temples honoring the Gods, the highest of which is the sun. Their Empire only lasted 350 years - think what might have been if the Spanish had not arrived. We drove from Cusco through the Sacred Valley today. The Sacred Valley is an incredibly beautiful stretch of land bordering both sides of the Urubamba River from near the town of Pisac, through the town of Oilantaytambo to Machu Picchu. Why Sacred? The source Urubamba River is the highest mountain in Peru. It is snow-capped; it sacred because it is closest to the sun. Because the mountain is sacred, its river is also considered sacred and the valley through which it flows is sacred as well. On the drive we stopped at the "factories" just outside Cusco where we learned to recognize real and fake Alpaca, Baby Alpaca and Lama yarns and their finished goods. Baby alpaca is considered most desirable. Baby alpaca wool comes from the first cutting from the animal and it comes from the chest area only. A simple Baby Alpaca scarf costs well over $100 US; a sweater is $360, minimum. Silver jewelry, not 9.25 found in Mexico, but 9.5 is sold in the market as well. This silver is very pure is often set with semiprecious stones all mined locally. Tempting, I must say. We stopped in the Pisac market which is another huge handicraft market. We wandered the aisles admiring the interesting and appealing, but far too colorful goods to every find a comfortable place in our home. 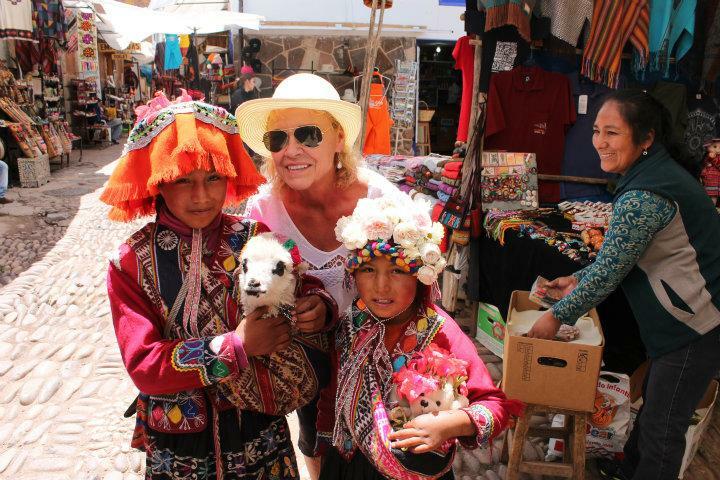 I did spend one Peruvian sol to have my photo taken with two darling little sisters and their baby lama, and I sprang for a hand-painted wooden plate that features the Inca calendar and a lama. We had lunch at one of those restaurants that cater to tour groups but the oplace was pleasant and the food was really good. It featured all Peruvian dishes and plenty of them. A group of locals playing beautiful Peruvian and Incan music entertained us. I was tempted to purchase their CD, but I've done that before and wondered why when I played it at home. The highlight of the day was the ruins at Oilantaytambo. Climbing the 400 irregular stone steps to the top of the Temple of Sun provided a 360-view that was breath-taking. But looking at and touching walls built by the Incas so long ago was very sobering. Those dang Spaniards! They stole the gold and silver, destroyed temples and executed Inca nobles to expedite the spread of Christianity. I'm a Christian and the people here are too - 95% are devout Catholics. Still, methods used to arrive at this point are hard to swallow . . . and this story is not new; it is told over and over again throughout the world and throughout history. Our hotel is absolutely delightful. Its name is Hotel Pakaritampu - say that 5 times. It sits at the foot of the mountain we climbed today. It looks like a western hacienda with green lawns and flowers on ancient terraced grounds. It has a pen of lamas, flowers everywhere, hummingbirds (big ones!) and mountain views on all sides. Sadly we are here only one night.